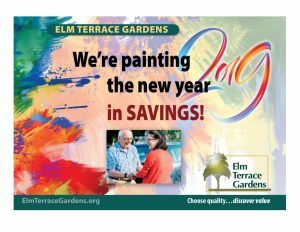 Founded in 1981 by members of the First Baptist Church of Lansdale, Elm Terrace Gardens is a not-for-profit, Life Plan Community (also known as Continuing Care Retirement Community) open to people of all faiths. As a Life Plan Community, Elm Terrace Gardens provides a full range of lifestyle and healthcare services, all under one roof. Services include: independent living, personal care, rehabilitation and skilled nursing care, as well as new Aspire Memory Care coming soon! With wellness programs and supportive services, plus access to higher level of care if health needs change, residents also have peace of mind knowing that their needs will be met both now and in the future. With our rich 31-year history as a Life Plan Community in North Penn, you’re bound to see a familiar face at Elm Terrace Gardens! Contact us today to learn more about our well-designed residential living apartments and flexible financial options. Or, if it’s healthcare that’s needed, schedule a personal tour to find a lifestyle that meets your needs.